Indulge yourself into spa like comfort right in the convenience of your own home with this Superior® Egyptian Cotton 900 GSM Bath Towel (Set of 2). Crafted from the finest quality 100-percent Egyptian Cotton, their 900 GSM construction provides high-absorbency and plushness. Available in 19 versatile color options ensures the perfect accent to your decor. Care Instructions: Machine Washable. Recommended to follow care label instructions. My review is more for the confusing way this product is listed than for the product itself as I only received it recently. Having ordered a set of Superior Egyptian towels in the past (two each: bath, hand towel, washcloth) and having been pleased, I hoped to replicate. I searched Superior Egyptian towels and several appeared, all with the same picture. I selected what I thought was a set as before. What arrived was two bath towels. A check of my order and indeed I did order two bath towels. Additionally, they are NOT EGYPTIAN, as my previous towels. I bring this up for purchasers to be aware of the confusing way these are listed with Overstock. Carefully read the description. Do not assume you will be getting Egyptian cotton. It must say Egyptian cotton in the description and on the tag. This was just wow! This was a very luxurious Bath Towel set. Although I didn't know what GSM meant it looked and sounded from the review to be excellent quality. I had to look up GSM on Google because no where was it defined in the explanations. This is what it said: "GSM is short for grams per square meter. All fabrics have a weight, and the standard measurement for the weight and quality of fabrics (including towels) is grams per square meter. This number refers to the density of the towel. High quality Turkish cotton towels are generally heavier and are more absorbent." Boy was this true! After washing per instructions, I dried them in my dryer and still couldn't get them completely dried in the middle. So I hung them out for a little more drying. 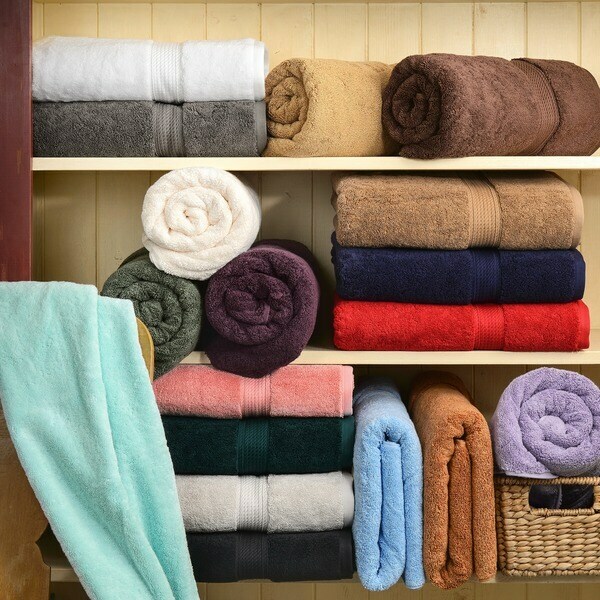 These towels are amazingly heavy, soft and absorbent. They were thick enough to feel like a very nice blanket. Perhaps just a tad bit more luxurious than needed, but they are very nice. The only problem I had was with the color. The "plum" color had just a little too much of a red overtone for my love of purple. Otherwise these towels were amazing and well worth the price. These towels are thick and plush. A bit heavy and not so much on the soft side, but they get the job done. As one customer said, there was a heavy smell of formaldihyde. I had to wash the towels twice, and give an extra rinse to get the smell out. Other than that, the color holds well. I am glad I got these towels. very disappointed. I wish we could send them back. Towels are very thick and feel quite nice but after a few months all of the seems/edges are shredding. I was so sick of spending money on cheaper towel and ended up extremely disappointed. I finally came to my senses and ordered 2 of these 900 Gram Egyptian Cotton Bath Towels. What a world of difference! They are super soft and absorbent. I ordered the forest green ones and the color stays true after washing. I am very happy with these bath towels and will be ordering more soon! Luxurious 900 Gram Egyptian Cotton bath towels (set of 2) These towels are of great quailty and great price. Nice and large. I just love them. I have to say I'm not really one for rating things after purchasing,I think after these towels I have become a new rater from now on. They are the most by far the best towels I've ever used after my bath/shower. My shower is no longer just a shower its an experience I look forward to knowing I will complete my shower with drying myself with one of these towels. I now have the luxury of a 5 star Hotel bath towel at home everyday. You can be the talk of your guests when leaving these towels in your guest bathroom. I can't say enough about them. I have other 900 gram towels purchased previously from a different seller and there is no comparison, when you pick up one of these even next to my other 900 gram towel you know your picking up a quality towel. They're not only THICK and very absorbent, you just know your handling something of quality. When you wash them in cold and dry them on low in the dryer they come out super. I've had them now a few months and have washed them several times we use a towel once and then in the wash it goes. My husband and I don't believe in using the same towel twice, because of the skin cells that come off on a towel after a shower, so after several washing's we haven't had any problem with our towels at all. If you want a towel to last longer then most and have an not just have a shower but an experience then I will recommend these towels to you. You won't be sorry. THE COLOR AND QUALITY ARE VERY GOOD AND I AM GOING YO BE ORDERING MORE. THANKS FOR A GREAT PRODUCT. after 3-4 washes the side border is coming apart where it meets the towel itself. apparently shoddy workmanship. They are the softest, thickest and most Luxurious towels I have ever found. I've only had them for a month, but they have washed well, don't shed hardly at all like most new towels and drape me in comfort when I step out of the shower. You can't go wrong with these towels and I am back here today to purchase more before they are out of stock! Again...very soft and absorbent. Great way to finish a shower. Recommend highly. Unbelieveable quality for the price!!! I had read the positive reviews about these towels, but was still surprised at the quality of them when they arrived. They are large and very thick and absorbent. I couldn't find any better ones, even in the finer stores. Highly recommend!!!! These towels are great. They are thick and soft and very absorbant. They didn't feel that thick or soft until I washed them, then they puffed up and were better than I could have hoped. I'll definitely purchse them again. These are gorgeous towels, the color is a deep dark navy like I wanted. Huge, even though I knew the dimensions at the time of purchase, it was a surprise when I opened the towels and laid them out to look at them. They are so soft, washed up beautifully. Instructions said to dry on low, and by doing that you don't shrink the decorative band on the two edges. It will shrink some but dried on low heat prevents a lot of that. Absorbed nicely during use and air dried out good. My climate is dry, so if yours isn't I am sure you know how to handle that problem. I love how thick and luxurious these towels are later I will order more. Pure luxury. Very happy with purchase and Overstock had these at a great price. I love the color and how nice and thick these towels feel. I've washed them multiple times and they are holding up well. Did have to cut off a few stray strands when first washed, but nothing major. Yes, they did fill the filter of the dryer a couple of times after drying, with lint, but that has become much less over time. They are a nice heavy weight towel and just what I was looking for. I would recommend these towels. Good value. Not very luxurious. It takes 2 days for one to dry out from a shower even when hung on a door. Wow these towels are the greatest for drying up after a shower. My other towels would have to be washed after two showers as they start to smell sour. These towels soak up and dry up fast. It pays to spend more but in the long run you end up washing less. You save money and electricity. I would buy these again and probably will. "Why is the color Seafoam not available for individual towels, only in the set????" "How do i tell which colors are which? Is the seafoam the rich aqua color? Thanks." If you click on the big picture, little pictures appear below. In little tiny print, the color is listed below each little picture. Thanks, Glad they added those - big help. "Is the purple the lavender like color pictured or is it a deep purple?" neither. it is a bright fuchsia. I bought it for my son who loves purple. not a hit. Their deep purple is listed as "Plum" color. I personally felt the color was "off". It was purple, but with reddish tones compared to my other deep purple/plum colored towels. "I would like to buy 12 different colors superior luxurious and absorbent 900 GSM Combed cotton bath and face towels. Is this option available ?" "When next would you have the Charcoal towels in stock?" "Do you know what type of cotton these towels are made of?" I'm not sure but they are VERY thick. 100% Egyptian Cotton. They are very thick towels. The label says that they are 100% Egyptian cotton, although the description does not now say it is Egyptian cotton. I suspect it is not Egyptian cotton, but they are very nice towels. I purchased first set five or six years ago, and a second set last fall. Very large, very thick, and very nice. The towels say 100% Egyptian cotton on the tag but it also says made in India. They are thick, and are holding up well. But they do take a long time to dry in the dryer. It states on the tag that it is 100% Egyptian Cotton. "Several reviewers have mentioned the towels come apart. Is there any kind of guarantee or is a refund or replacement available if this happens. The return policy states only new items can be returned or used items are not refunded at full price. If I buy these, and they fall apart, I would expect a full refund or replacement." Hello kkhall, Overstock.com stands behind every product we sell. When necessary we can contact suppliers if a product issue arises. Thank you for shopping with us. I have my towels now for a year and a half now and they get washed after every use we believe in a clean towel after each use so therefore our towels get plenty of use and washed often. What I have noticed with many people is when a product doesn't work for them they right away feel that the product isn't good or some sort of defect, not always the case with many products. If one would follow the directions on the label they would be very surprised as to how the item will work for them. I know most people think that towels should be washed in the hottest water possible, not so, these towels should be washed in cold water and dried in the lowest setting possible, they are very thick so therefore they will take longer to dry but that is what you get with a thick and thirsty towel such as these, and also NO bleach at all, I also do not use any fabric softener on towels, none. As I said I have them and love how they preform for our family I haven't found better towels then these. As far as returns and refunds you would need to contact where you made the purchase for an answer to that question. I can't see why you would not be compensated if you have a problem, but as I said you would need to contact customer service.